Thanks to these traditional Italian biscotti recipes, you'll never go back to eating a store-bought biscotto. 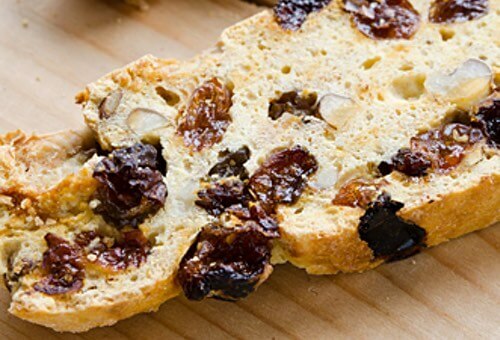 Now, you'll be able to make your very own homemade biscotti from scratch that taste superior to any you can buy. 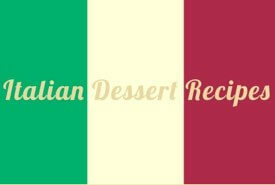 Try them and experience the delicious, Old World taste of Italy's most popular biscuits. They're perfect to enjoy with your hot cappuccino. 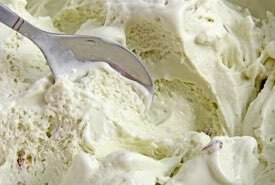 Flavor: almonds, pine seeds, aniseeds. One pound flour, 1/2 pound granulated sugar, 1/4 pound sweet almonds, whole and shelled, mixed to a few pine seeds; a piece of butter, one and a half ounces; a pinch of aniseeds, five eggs, a pinch of salt. Leave back the almonds and pine seeds to add them afterward, and mix everything with four eggs, so as to use the fifth if it is necessary to make a soft dough. Divide into four cakes half an inch thick and as large as a hand, place them in a receptacle greased with butter and sprinkled with flour. Glaze the cakes with yolk of eggs. Bake in the oven, but only as much as will still permit cutting the cakes into slices, which you will do the day after, as the crust will then be softened. Put the slices back in the oven, so that they will be toasted on both sides and you will have the crisp biscuits. Flavor: almonds, candied orange or angelica, fruit preserve. For this Italian biscotti recipe, it would be necessary to have a tin pan about four inches wide and a little less long than the oven used. In this way the biscuits will have a corner on both sides and, if cut a little more than half an inch, they will be of the right proportion. The ingredients needed are: flour, about two ounces; potato meal (flour), a little less; sugar, four ounces (1/4 lb); sweet almonds, 1-1/2 ounces; candied orange or angelica, one ounce; fruit preserve, one ounce; three eggs. Skin the almonds, cut them in half lengthways and dry in the sun or at the fire. Pastry cooks usually leave them with the skin, but it is much preferable to skin them. Cut in little cubes the candied fruits and the preserve. Stir for a long while, about half an hour, the sugar in the egg yolks and a little flour then add the whites of the eggs well beaten and when everything is well beaten add the flour and potato meal, letting it fall from a sieve. Mix slowly and scatter on the remaining ingredients, mixing the almonds and the cubes of candied and preserved fruit. Grease and sprinkle the tin box with flour. Bake in the oven and cut the biscuits the day after. If desired, these can also be roasted on both sides. Flavor: currants, candied fruits, taste of lemon peel, brandy. Granulated sugar, six ounces; flour, four ounces; potato meal (flour), two ounces; currants, three ounces; candied fruits, one ounce; five eggs, a taste of lemon peel, two tablespoonfuls of brandy. For this Italian biscotti recipe, put first on the fire the currants and the candied fruits cut in very little cubes with as much brandy or cognac as is necessary to cover them; when it boils, light the brandy and let it burn out of the fire until the liquor is all consumed; then remove the currants and candy and let them dry in a folded napkin. Then stir for half an hour the sugar with the egg yolks and the taste of lemon peel. Beat well the white of the eggs and pour them on the sugar and yolks. Add the flour and potato meal letting them fall from a sieve and stir slowly until everything is well mixed together. Add the currants and the pieces of candied fruits and pour the mixing in a smooth mold or in a high and round cake dish. Grease the mold or the dish with butter and sprinkle with powdered sugar or flour. Put at once in the oven to avoid that the currants and candied fruits fall in the oven. Flavor: plain, or taste of lemon peel. Six eggs; granulated sugar, nine ounces; flour, four ounces; potato meal (flour), two ounces; taste of lemon peel if desired. For this plain Italian biscotti recipe, stir for at least half an hour the yolks of the eggs with the sugar and a tablespoonful only of the flour and meal, using a ladle. Add a taste of lemon peel if desired. Beat the whites of the eggs until they are quite firm, mix slowly with the first mixture and when they are well incorporated pour over from a sieve the flour and the potato meal, previously dried in the sun or on the fire. Watch the short YouTube video below as this delightful 94-year-old lady shares her mother's authentic Italian biscotti recipe from years ago. So authentic, so delicious! Perfect for the Christmas Holidays or anytime you fancy a treat. Bake biscotti at 375°F for 15 to 20 minutes, or until done. Brown at 300°F for 8 to 10 minutes on each cut edge. Melt ingredients 5 to 7 minutes on low heat. Potato meal isn't often found for sale nowadays, but potato flour offers a good substitute, though it's a finer grind or texture. Different from potato starch, potato flour is a flour made from grinding dried, whole potatoes and is used as an alternative to wheat flour for gluten-free cooking. It helps to improve texture and add moisture and a natural sweetness when added to cookies and cakes. If potato flour is unavailable, twice the amount of instant potato flakes can be substituted with good results in recipes. For example, 2 ounces potato flour = 4 ounces potato flakes. These are traditional, healthy recipes calling for all-natural ingredients. You'll be able to make your own biscotti the old fashioned way, using no preservatives and having real food flavors. Just imagine how good they'll taste. 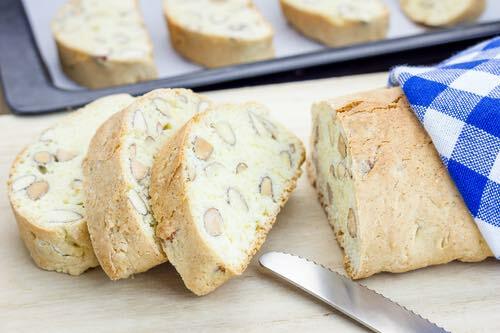 The Italians have long enjoyed a deserved reputation for their skill in perfecting delicious cookies, and these almond biscotti represent some of their finest. They're perfect for serving on any occasion and delicious when served with espresso or your favorite Italian gelato. You'll truly love the Old World taste and feel the pride of having made them yourself. 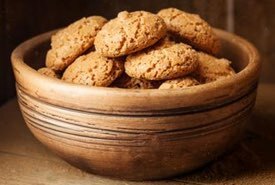 Questo biscotti antiquato è delizioso.